Rihanna is out with a new song called ‘Umbrella’ ? Good. 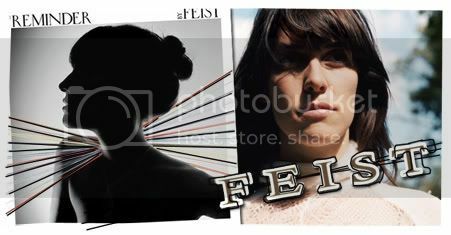 Feist is out with her latest third album called ‘The Reminder’? Great. Ever heard of her music? She writes fantastic songs like, ‘My Moon, My Man’, ‘1234’ and ‘I Feel it All’ just to name a few. She’s also one of the members of Broken Social Scene. Ever heard of the group? Good. Because I’ve never and am not ashamed to admit it. But, this album – it’s her solo project and she’s doing really well. I’ll try to make it easier for you; I’ll try to relate her to some other female artists. She sounds like….that’s funny – I can’t relate her to any other female artists. Maybe it’s my brain; I think it’s decaying. You want to judge her music for yourself? Go ahead. You know the drill – right-click, save as.